10 days for groups prior to arrival and full payment. 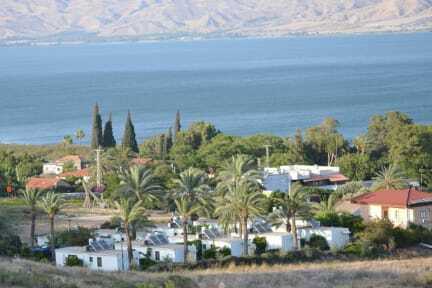 Shalom and Welcome to Kinneret Village, conveniently located by the Sea of Galilee in Israel. Kinneret Village is a great base from which to explore the northern region of our vibrant Holy Land. We are located only a few minutes’ walk to our private (fenced) beach, and less than 1 km from Yardenit, the famous and distinguished baptism site on the sacred Jordan River. We embrace pilgrims from all four corners of the world who come to the Holy Land and to Yardenit for the specific purpose of walking in the footsteps of Jesus, and to be part of the traditional baptism as performed by their Savior, right here on the Jordan River. The resort provides the best in services and amenities. 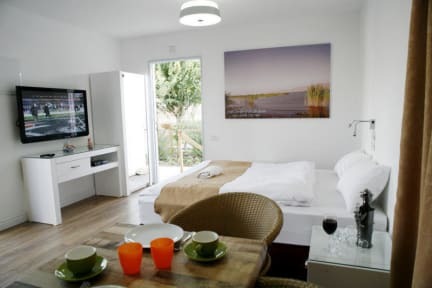 We provide among our blossoming garden, comfortable rooms with en-suite bathrooms, modern air conditioning, Wi-Fi in the public areas and parking spaces aside the rooms. The ambiance of Kinneret Village reflected through the facilities in every guest room: flat-screen TV with news, sports and movies channels, Espresso machine, well-equipped kitchenette, are just a few of the many facilities at your disposal. The resort offers a host of recreational activities in the area, which ensure there is plenty to do during your stay with us, include an Olympic swimming pool in a nearby kibbutz in the sessone. Pub and a grocery nearby. Kinneret Village is an ideal “home-away-from-home” for travelers seeking comfort, charm & value on the sea of galilee.